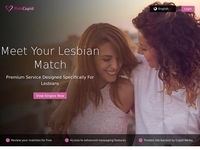 "PinkCupid.com is an online lesbian dating site dedicated to lesbian singles seeking love, chat, friendships and much more! Join today to start meeting single lesbians!" Just Positive Love is a dating site for singles living with HIV / AIDS. As HIV has changed over time into a manageable disease, rather than an almost certainly fatal one, more and more people are continuing life (almost) as normal. With this realization that one is not given a 'death sentence' when diagnosed as HIV Positive, many people have turned to online dating sites as ways to find partners for romance and support. Check out Just Positive Love to see if this is the site for you. "A dating service specializing in special health conditions, including STD dating services. These days, many people are seeking others online and consequently, specialized alternative dating services have emerged." "Polymatchmaker.com is an online community in which thousands of members come together to learn, share, empathize, grow, and maybe even find love. Our hope is to provide a safe cyber village of diversified Poly People who care enough to contribute, each in their own way, to the success of such a place." "With 13,000 members, our free service is the fastest growing online community for HIV positive dating and mating.